Also known as the ant-hill tiger, or little spotted cat, this is the smallest of the African felids. It is reputed to be exceptionally fierce. As the more common name suggests, the undersides of the feet are black. Its coat varies from dark to pale ochre or yellowish brown and is darker on the back. 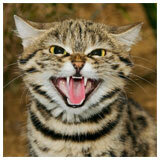 The black-footed cat is marked with bold black spots, arranged in rows on the throat, chest and belly. A black line runs across the cheeks from the outer corner of each eye. The front legs are marked with two transverse bars, and there may be up to five bars on the haunches. The short, thin, tapering tail is ringed and tipped with black, and the ears are reddish brown and slightly rounded. When stalking the ears are flattened so the animal can present a low profile. F. n. thomasi has a darker coat than F. n. nigripes. Black-footed cats are the ecological equivalent of the more northerly distributed sand cat. They live in open dry areas, desert, the Kalahari sand plains and grasslands. Secretive, they require some form of cover in the form of rocks or scrub. Powerful diggers, they will often use the burrows of spring hares and hollow termite hills for dens. The northern limit of their distribution is 20-21° south latitude. 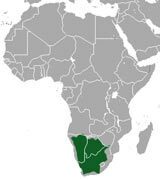 Widely dispersed through Botswana the westernmost records are from Okahanja and Windhoek in Namibia. Believed to be extinct in Natal they are found in the Kruger National Park, southwest Zimbabwe, Transvaal and Albany. It is possible that there is a population in Mozambique. The map shows the present distribution of Black-footed cats in green. Their diet consists of shrews, gerbils, hares, lizards and beetles. In one study, 57% of stomachs contained murid or mouse-like rodents, and 43% contained arachnids. Highly opportunistic, black-footed cats will take any prey they can overpower. One male was recorded as having ingested 450 grammes in one night, nearly one third of his bodyweight. Uneaten food is cached for later. They have been observed to scavenge springbok carcasses and take birds in the air. Black-footed cats are regularly reported to hang onto the throats of sheep until they pierce their jugular veins! While eating they empty the contents of their prey’s stomachs and intestines, pulling them through their teeth to squeeze the contents out. They will drink if water is available but they usually get all the moisture they require from their prey. It has been reported that they will also eat a lot of grass. Solitary and nocturnal, there is minimum contact between the sexes, even during courtship. Black-footed cats are described as expert climbers. As small animals they are vulnerable to predation and thus take cover at the least disturbance, the mother has a special alarm call which causes the young to scatter and hide. A notably loud miaow helps them to relocate each other. Oestrus lasts an average of 36 hours and in that time the female is only receptive for five to ten hours. One or two kittens are born after a gestation period of 59 to 68 days. They weigh about 60-88 grammes at birth and their eyes open in about seven to nine days. Precocious, the kittens eat their first solids by 35 days and are able to catch their first mice about ten days later. Permanent upper canines appear at 146-158 days. At birth black-footed cats are more mature than domestic cats and they grow faster. However, it takes them twice as long to reach sexual maturity. Female black-footed cats are sexually mature at 21 months. Captive individuals have lived for more than ten years. Insufficient information is available to assess the population numbers of the black-footed cat. It is rare and has a very limited distribution. The captive population is very inbred. The black-footed cat is not persecuted as a threat to livestock and it seems to be trap-shy, and therefore it is not easily caught. In most of their ranges they are not threatened. J. Visser stated that the black-footed cat should not be on the endangered lists because it was not in any danger of extinction (Cat Group Meeting: the Black-footed cat. Cat News 4, 1986, p. 13). The Convention on International Trade in Endangered Species (CITES) has listed it on Appendix I, prohibiting all international commerce.